Rereading her childhood diaries, Heidi Julavits hoped to find incontrovertible proof that she was always destined to be a writer. Instead, they “revealed me to possess the mind of a phobic tax auditor.” Thus was born a desire to try again, to chronicle her daily life—now as a forty-something woman, wife, mother, and writer. A meditation on time and self, youth and aging, friendship and romance, faith and fate, and art and ambition, in The Folded Clock one of the most gifted prose stylists in American letters explodes the typically confessional diary form with her trademark humor, honesty, and searing intelligence. 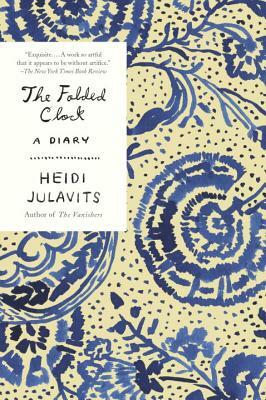 Heidi Julavits is also the author of four critically acclaimed novels (The Vanishers, The Uses of Enchantment, The Effect of Living Backwards, and The Mineral Palace) and coeditor, with Sheila Heti and Leanne Shapton, of the New York Times bestseller Women in Clothes. Her fiction has appeared in Harper’s Magazine, McSweeney’s, and The Best American Short Stories, among other places. She’s a founding editor of The Believer magazine and the recipient of a Guggenheim Fellowship. She lives in Manhattan, where she teaches at Columbia University. She was born and raised in Portland, Maine.